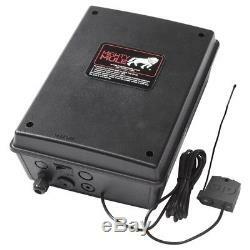 Heavy Duty Dual Swing Automatic Gate Opener, Solar Power Capable By Mighty Mule. 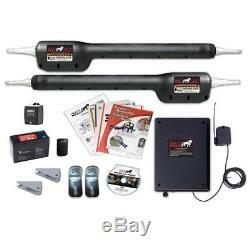 The MM562 Automatic Gate Opener is Mighty Mule strongest and most durable dual swing gate operator. 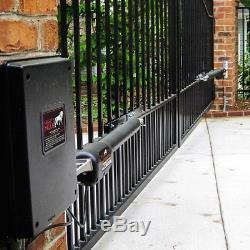 Mighty Mule gate openers are designed to be easily to install with no electrician or welding required. The Mighty Mule MM562 Heavy Duty Gate Opener is designed for dual swing gates up to 18 ft.
Long or weighing up to 850 lbs. The MM562 can be utilized for many applications including residential, agricultural, farm and ranch, etc. This gate opener and all Mighty Mule automatic gate openers are solar capable with the addition of a Mighty Mule 10-Watt solar panel (Model # FM123). Its compatible with all Mighty Mule keypads, gate opening remotes and gate opening sensors. 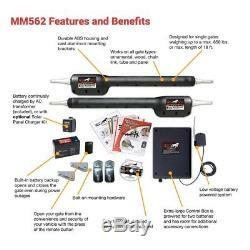 The MM562 kit includes everything you need for installation. This opener comes equipped with Mighty Mules exclusive Dual Sense Technology, which meets the UL325s 6th Edition Standards for additional user protection and safety. The Mighty Mule Dual Sense Technology provides users with added safety features, eliminating the need for secondary entrapment devices, such as photo eye sensors (Model # R4222). Designed for heavy duty dual swing gates up to a maximum of 18 ft.
Long or maximum of weight of 850 lbs. Perfect for all gate types including chain link, tube, panel, vinyl and wood. 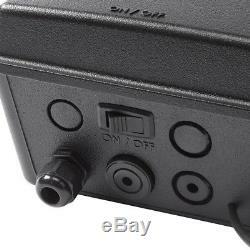 Includes: 1 single button access remote (model # FM135), AC transformer (model # RB570), 12-Volt 7 Amp-hour battery (model # FM150), control box, all required hardware and a detailed installation manual with an interactive DVD. Features Mighty Mules exclusive dual sense technology that meets UL325's 6th edition standards for additional user protection and safety. Solar capable: with the addition of a Mighty Mule 10-Watt solar panel (model # FM123). Designed for pull to open installations, push to open installations require two push to open brackets (model # FM148). We stand behind our products. Our stock all ships from our US-based warehouses. Most orders are in transit for two days but some may take longer. 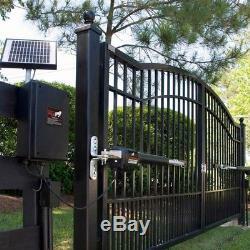 Heavy Duty Dual Swing Automatic Gate Opener, Solar Power Capable By Mighty Mule Heavy Duty Dual Swing Automatic Gate Opener The MM562 Automatic Gate Opener is Mighty Mule strongest and most durable dual swing gate operator. This gate opener and all Mighty Mule automatic gate openers are solar capable with the addition of a Mighty Mule 10-Watt solar panel (Model FM123). 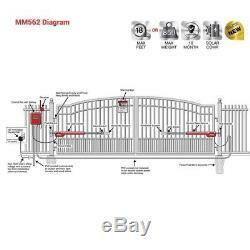 The MM562 kit includes everything you n.
The item "Heavy Duty Dual Swing Automatic Gate Opener, Solar Power Capable By Mighty Mule" is in sale since Saturday, September 22, 2018. 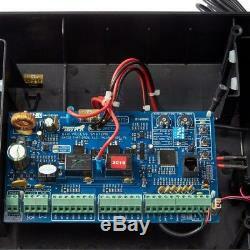 This item is in the category "Home & Garden\Home Improvement\Building & Hardware\Garage Doors & Openers\Opener Systems". The seller is "bestvaluesellers" and is located in St Louis MO. This item can be shipped to United States.